California enthusiastically is embracing the new national Common Core standards for students. 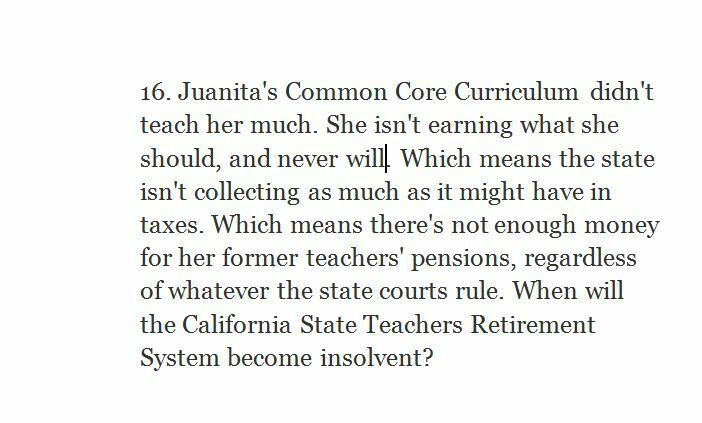 Here’s an actual question of the sort that’s going to be facing the students, as posted on a quiz page on the site for the Genesco Commnuity Unit School District #228 in Chicago, a government school. The problem with the problem is that we don’t know how many friends she has, nor how many stickers are in a bag. If she has two friends, and there are 10 stickers in each bag, then 4 or 6 bags would be correct answers; just give two or three bags to each friend. But if there are three friends and 11 stickers in each bag, then the answer has to be 6 bags, because you can give each kid 2 bags. That’s easy. With 4 bags, you can’t divide the bags by 3, so you have to go down to the sticker level. But that would mean 44 stickers divided by 3 students, which results in 14 stickers for each kid, with two left over. But you’re not supposed to have any left over. What if she has four, five, six or seven friends? It becomes more complicated. That’s assuming I’m reading the question correctly. If you a different answer, or answers, post in our Comments section, below. Too bad for California’s, and America’s, children. They’ll be competing with computer wizards from China, India, Korea, Japan, Finland, etc., after such terrible training they’ll be getting from the U.S. schools. 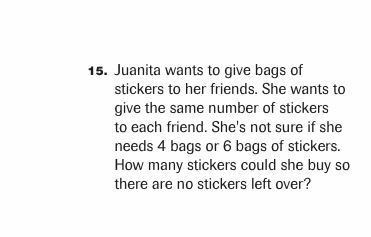 What the person who digested this problem didn’t read into it is that Juanita very likely is filling bags herself with stickers she bought. She might at the moment not know if she is going to be in the company of either 4 — 6 kids. What this problem deals with is finding a common multiple between 4 and 6. The question does not ask how many bags she needs to buy. She could be using brown lunch bags on hand in her kitchen pantry. The question asks how many stickers she needs to buy. She needs to buy 12… or 24… or 36… it just depends on her math skills and how generous she is willing to be.